We were having a serious case of the Mondays. It was first period on Monday morning and it was Pajama day. No one was alive. I tried all my tricks to wake them up but to no avail. I planned to to a story…I wanted to do a story…but I just knew that it would be an uphill battle. This is an activity I’ve been doing for a couple of years and it’s good way to load them up with a lot of comprehensible input. And it’s hilarious and it’s a 2 part lesson, so you get good mileage out of it. AND SO MUCH REPETITION!!! Students put their board, marker and eraser under their chair. They don’t illustrate as we’re deciding details. Teacher facilitates storytelling (asking questions, eliciting student responses, summarizing the information and keeping everything nice and slow and comprehensible). Since I’ve discovered my new favorite toy, an online magic 8 ball in SPANISH, we’ve been using it a lot of establish story details. And even if they’re DEAD ASLEEP and refuse to participate, you can just make up the details. It’s still input! At a good stopping point (after establishing a few details) students pick up their board, marker and eraser. They are not to illustrate from memory! They are to listen to the teacher’s retell of the story and illustrate the part the teacher is describing to demonstrate comprehension. While students are illustrating, teacher circulates, repeats, comments on pictures, etc. I like to pick up hilarious illustrations and show the class, point to everything and retell. 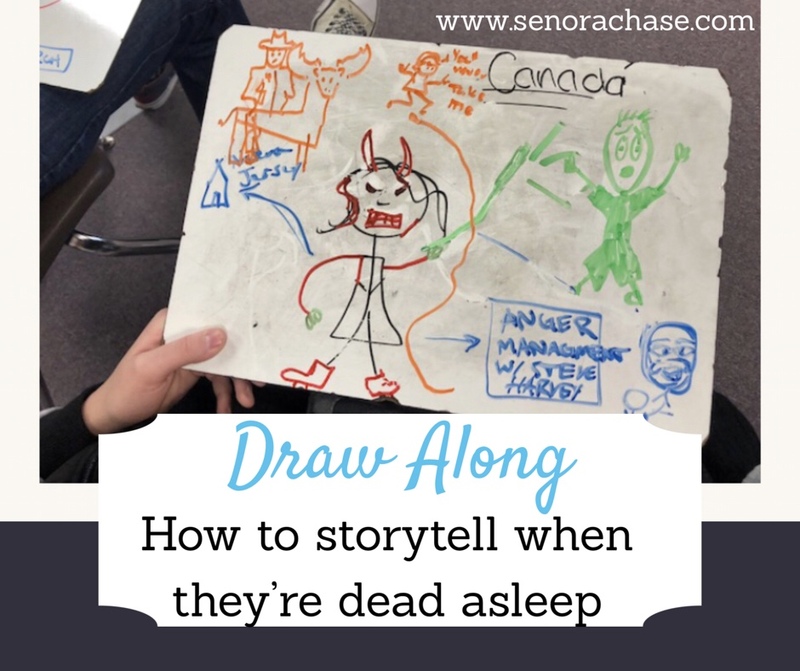 Once they’ve had time to illustrate (and I’m talking the whole time, retelling the story) I count down from 10 to 1 as their cue to wrap it up. By 1, their marker should be capped and their whiteboard under their chair. Students do not erase their illustrations! Teacher continues facilitating the storytelling with the next part of the story, getting student input. etc. Students take their board and pass it to the student to their left. Everyone has a new board! Before the teacher starts describing the new scene, teacher reviews the previous scene (that is already drawn on their boards). Students point to that story detail as I describe it and if they don’t see it, they are to draw it in. Now the teacher describes the newest scene which students illustrate. And repeat steps 3-9 until the story is over or you’re out of time. Then, this morning, in my other Spanish 2 class, each student took one boards (that was illustrated by the other class). Of course first they laughed at the pictures because they’re basically disasters. Then I explained the other class’ story. As I told it, they had to find the picture that matched the detail and show it to me by pointing. Then after we had a good laugh, we erased the boards and did the same activity, with a new story. Here are the boards, stacked and ready for my tomorrow’s class. Senora Chase, you are my super hero!!!!!!! Our school starts at 7:15. Amazing plan. Holy cow! Mine stumble in at 7:30 and that’s too early… What time does your school get out?! I’m glad it worked for your tired kiddos too! Gracias!!!! I’m gonna try it tomorrow! This is such a great activity idea! Especially with block schedule and needing to liven them up a bit! Thank you for the suggestions!